Click the icon for a list of Muslim voices speaking out against extremism and terrorism. Articles: Type Sheila Musaji into TAM search engine for a list. , 2012, 2011. We will update this regularly. — Due to a series of personal issues, I will not be updating this site for some time. The site will remain online, and there are many useful articles and article collections that may be utilized for research. provides a great deal of information in a summarized format. Clicking on any of the many links provided in this collection will take you to an article that provides a response or analysis of the particular claim or issue. Many of these articles have extensive collections of articles and reference materials. The easiest way to use this would be to use a “Ctrl F” search to find a response to any particular issue, claim, or common anti-Muslim meme. For example: Muslim Brotherhood Document, or unindicted co-conspirator, or taqiyya, etc. provides links to profiles and backgrounders on the key players. It is regularly updated. - Simply click on the logo on the homepage to go to a lengthy collection of Muslim denunciations of terrorism, extremism, and violence. Also includes collections of responses to claims about Islam and Muslims, resources about Islamophobia, and general resources on many topics. If you would like to place this icon on your website, please contact us and we will send you the artwork file. We have had a quantity of these made up in “Euro-style” 4 X 6” oval bumper stickers. We would like to have these seen on cars everywhere, and so are making them available at the best price possible. Contact us to purchase these at $1 each. 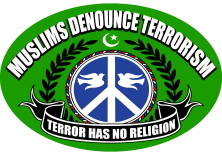 Click on the Muslims Denounce Terrorism icon on the main page for article collections on this and other topics. “Every gun that is made, every warship launched, every rocket fired signifies in the final sense, a theft from those who hunger and are not fed, those who are cold and are not clothed. This world in arms is not spending money alone. It is spending the sweat of its laborers, the genius of its scientists, the hopes of its children….This is not a way of life at all in any true sense. Under the cloud of threatening war, it is humanity hanging from a cross of iron. — Dwight D. Eisenhower farewell speech to the American people. Posted by Sheila Musaji at June 23, 2013.